If you are looking for information on the BabyPower Forever-Kids franchise business opportunity, Baby Power Forever Kids franchises or BabyPower ForeverKids franchising, then you have come to the right place. BabyPower Forever-Kids is today's most progressive and developmentally appropriate exercise and musical parent/child play program. BabyPower has operated successfully in Company owned centers throughout the Northeastern US for over 20 years. The program has been designed to build confidence and promote child development, communication and parent/child bonding. BabyPower introduces children to new playmates and the their most valuable playmates of all: THEIR PARENTS! That is because all BabyPower classes are parent-child interactive. So, when student achieves a breakthrough in sensory awareness, balance or language skills, the parent will actually see it happen! "It's great to see Baby Power expanding and wish you good luck. My first born (son) went to Baby Power for 2 years as an infant. In fact, he painted his first picture ever there and it is framed in his bedroom. He's 7 1/2 now. Linda was actually his teacher in Parsippany. I even have a home video of it. We moved to the Toms River area and my middle child never got the Baby Power experience that I loved with my son. I also met one of my best friends there and the boys are still very close today." "I'd be interested in the Toms River schedule for my 3rd child who will be 21 months old in January. Looking forward to new memories." 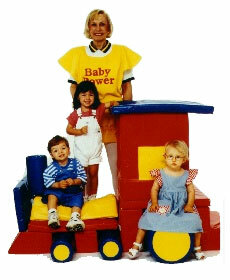 The BabyPower Program is a 10-week, hour long pre-nursery school play program for children and their parents. The course is a systematically designed and consistently adhered to program customized for promoting child development, parent/child communications, play and bonding. Parents participate equally with their children during each one hour session. BabyPower graduates are more prepared to enter daycare and school programs than other children. Our graduates learn to follow direction as they develop a more outgoing personality. Graduates are more adjusted toward interacting with others, thus paving the way for the development of life long friendships and excellent learning behavioral skills. The Forever-Kids Programs at Baby Power were designed to develop the second phase in a child's development. Through arts and crafts, cooking, theme classes, gym play and science experiments, fine motor skills, hand-eye coordination, and self expression are culitvated while using creativity to have FUN. Play Is A Very Profitable And Rewarding Business! As the creator of this uniquely different interactive parent/child play program, we've built a business system that is tremendously successful and operates with ease. Our unique approach has created a loyal customer base that continues to grow. The proven track record of our BabyPower Forever-Kids centers demonstrates that the formula works. Through the BabyPower Forever-Kids classes, merchandise sales and birthday parties, there are tremendous opportunities for you to enjoy unlimited growth potential and income! The program has been so successful that we retain more than 70% of our business semester to semester. Direct mail programs targeting parents with children under the age of 4 years old. Lists are sorted demographically by income and provided to you as part of your franchise agreement at no additional charge. Professional marketing materials geared for Grand Opening, Open House, ongoing promotional programs, birthday parties, newspaper and direct mail. Copyrighted music, program materials, and characters. Program outlines and course materials. Site selection assistance and negotiations. Four BabyPower programs and continual updates. An unlimited growth and income opportunity. As long as families continue to have children, there will be a viable market for BabyPower Forever-Kids. If you enjoy working with young children and their families, BabyPower Forever-Kids is an opportunity you should strongly consider. Not only is BabyPower Forever-Kids a tremendous money making opportunity, the BabyPower Forever-Kids program provides a valuable service to the community at an affordable price. BabyPower Forever-Kids is a fantastic opportunity for the individual with small children or one who is looking to start their own business. As the owner of a BabyPower Forever-Kids Franchise, you determine the number of days you work each week and the hours you work each day.